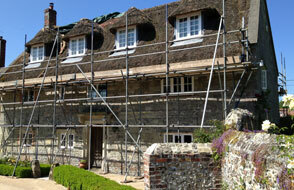 Scaffolding front and rear for the repair of a thatched roof in Sherfield English. 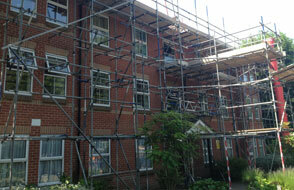 Full scaffolding for a roof renewal and various repairs to a block of flats. 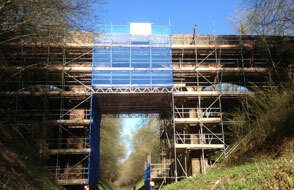 A complex structural scaffolding configuration to facilitate birdge repairs for the Watercress Line. Tubeline Scaffolding Ltd is a regional scaffolding contractor with a broad range of activities & clients. We are based in Dorset and offer a full range of scaffolding services, from private domestic works to a wide range of specialist scaffolding erection. We have over 20 years experience & and use the latest TG20 CAD system to produce plans and reports.